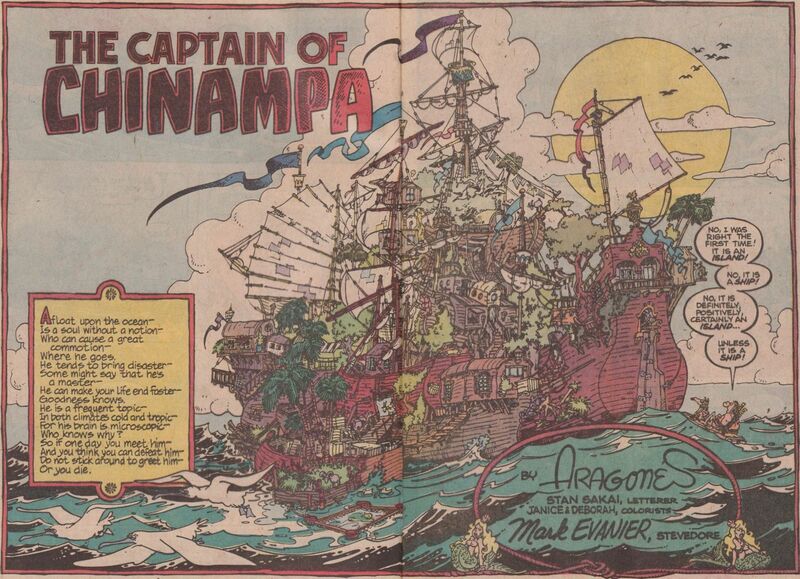 Here's a good example of an issue that uses the supporting cast well, establishing a premise and then seeing how each character reacts to it, and how their actions affect Groo, managing to find humor in each variation before bringing it back around to Groo himself and coming up with a satisfying conclusion. Plus, there's a bit of social commentary, with the story being a satirical look at people's nonsensical attraction to "gurus", which could be interpreted as "New Age" cultists or religious leaders (TV evangelists were a common target in the 80s and 90s), but also as motivational speakers, purveyors of self-help philosophies, or messianic public figures who don't really tell anybody anything they don't already know. 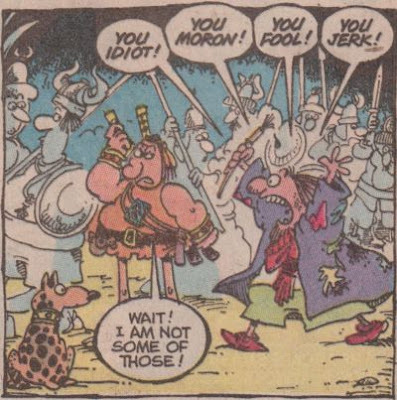 Whatever the metaphor is representing, the Groo Crew doesn't have much respect for them or their followers, starting with the platitude-dispensing wise man that Pal and Drumm come across at the opening of the story who says things like "Man knows he cannot fly, and so he does not! Birds do not know this and so can fly!" When he notices how much is being donated for the privilege of listening to such nonsense, Pal gets the idea to exploit this gullibility, and he recruits the Sage to offer similar advice. It's a great reversal, and a perfect encapsulation of the emptiness of this sort of thing, the way meaningless words can be twisted into something "deep" and "meaningful" if a receptive audience wants to interpret them as such. 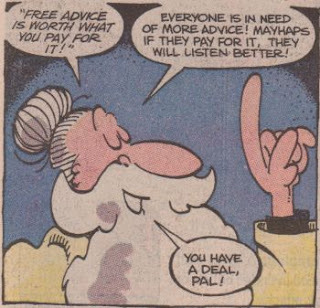 The creative team manages to get a lot of mileage out of the idea of Groo offering the most wisdom by telling people that he doesn't have any wisdom to offer them (and, by extension, neither do the other gurus), and the comeuppance that everyone (but not Groo, for once!) receives is quite satisfying. It's a perfectly-structured story, making great use of the included cast, offering up expectation and either delivering on them hilariously or twisting them into even funnier results. This is the kind of issue that I think of when I think about reading Groo; I expect more of the same from here on out. Moral: "Wisdom cannot be bought. It can, at best, be rented until you can find your own." Running jokes: Drumm is pretty sure that either Pal or the Sage were going to buy him a house, and he remembers to ask "What pirates?" Letter column jokes: Doug Smidebush starts off his letter with "Dear Groo people," then fills a lengthy parenthetical with thoughts that this might not be correct, since it would sound like he is writing to characters within the book, then considers other options and specifies that it could include everyone who works on the book, including Sergio, Mark, Stan, and all the various colorists and editorial staff. By the time he gets to the actual content of his letter, he forgets what he was going to say. Wes "Einstein" Eccleston says he used his superior brain to find the hidden message in the Groo poster, but Mark says his brain would have been more superior if he hadn't bought a Groo poster at all. John Chandler contributes a single-sentence letter saying that he wrote the letter all by himself, but he notes in a postscript that his mommy helped him with the first sentence. 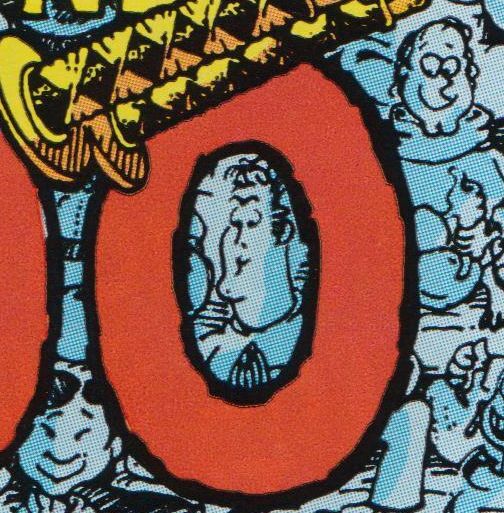 Vincent D. Taverney asks why Groo's nose looks like the number 3, and Mark says it's because that's the average number of times per hour someone wants to punch him in it, and that his own nose looks exactly the same. Jason Santa contributes the issue's Grooism, in which he saw an act with a parrot that was supposed to fly to somebody's hand, but instead it attacked a spectator, prompting a young boy to comment "I wonder if it took them a long time to train it to do that." 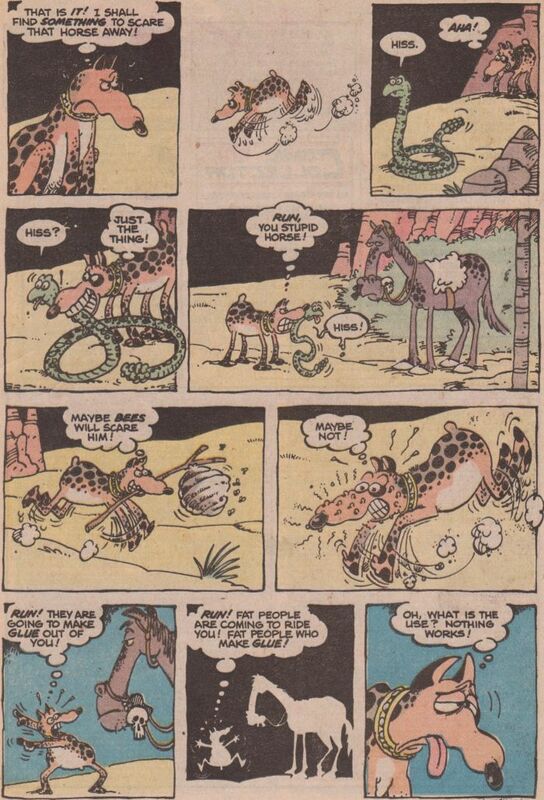 And Andy Neumeyer complains that Groo has never sneezed on an elephant, which he finds insulting because he sneezes on elephants for a living, so he demands that the title of the comic be changed to Groo, the Guy Who Sneezes on Elephants. Mark agrees, and refers to the series by that title at the end of the letter column. I don't remember if he kept up this joke in future issues, but I hope so. 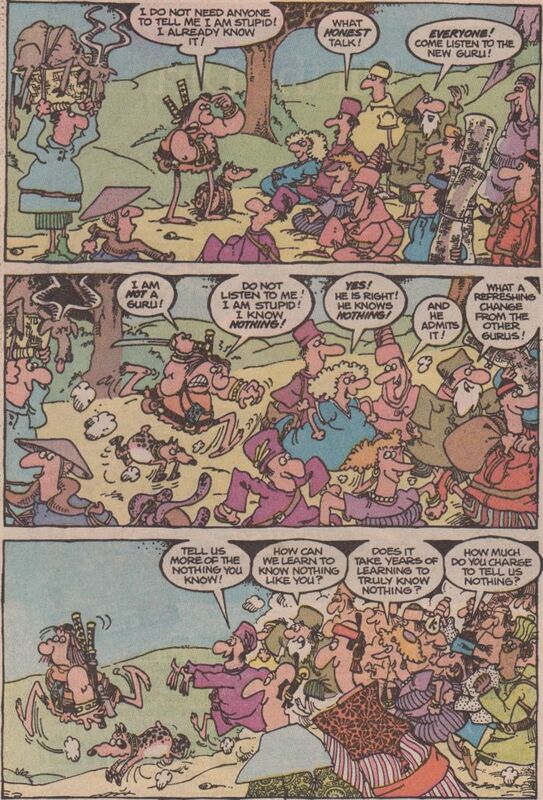 This might be the most overt "message" issue of Groo yet, in that it seems intended to highlight a topic and spur the reader to action. The issue at hand here is garbage, and the problems caused when it piles up without any long-term plans to do anything about it, with the encouragement to recycle as a solution. 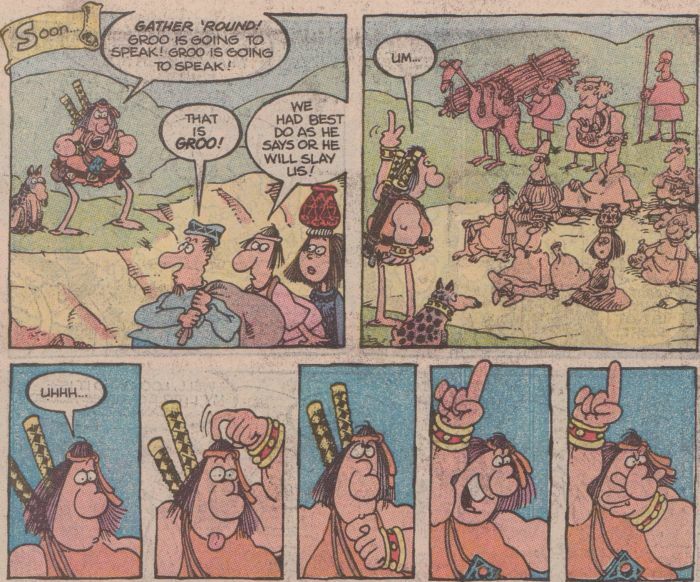 Of course, this being Groo, as much time is given to goofy jokes and general silliness as to speechifying, which is an approach that tends to make the message go down like the proverbial spoonful of sugar. It's when that balance is off that the comic can suffer (I can think of a few examples from further down the road...), but it's quite well-managed here, making for a fun romp that might just make one think. 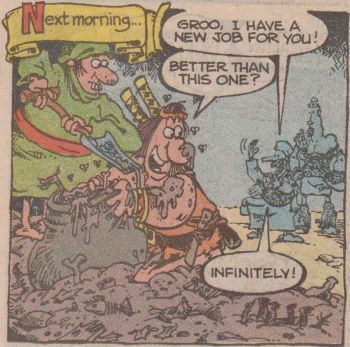 So: Groo is hanging out with the Sage, who comments on all the garbage littering the streets in a city they are passing through. Groo says that people might pay to have somebody take it away, a thought which he finds hilarious (because he is dumb, you see). 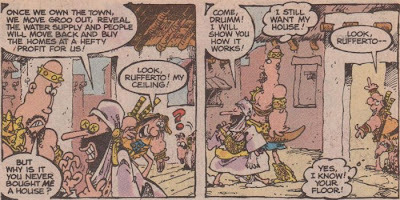 When the two of them run into Pal and Drumm, and Groo repeats his joke to them, Pal immediately seizes on the moneymaking opportunity. And so the plot is off, as Pal quickly starts making money in the new business of waste management, but immediately runs into problems disposing of all the refuse he collects. He tries burning it, but this pollutes the air. He tries dumping it in the ocean, but that kills all the fish. They seem to find a decent solution when Groo suggests dumping it all in a canyon, but when it fills up, they're stuck once again. 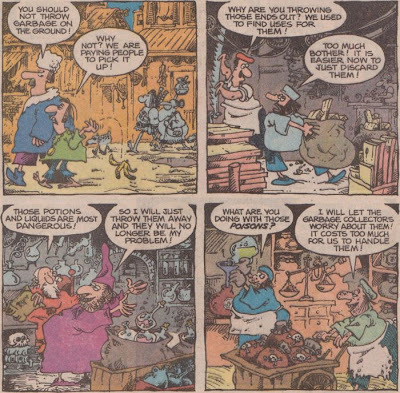 Sage eventually comes up with the solution of reusing the garbage, even using the word "recycle" to make sure readers get the message, but Groo manages to find the most disgusting way possible to ruin everything, providing a memorable finish for the issue. Drumm also gets relegated to the background, which is kind of a shame; I always thought the best Pal and Drumm stories involved them both contributing some sort of antagonism to Groo, with Pal using brains (yet still managing to find his schemes stymied by Groo) and Drumm using brawn (and Groo always beating him up). The creative team has found a good way to use Pal as someone who is constantly conniving his way into some profitable enterprise, but they're still working on getting Drumm involved. I know there's at least one story coming up that makes us of them both, so as usual, I suspect they mange to figure it out. There's something viscerally upsetting about the images of trash that fill the issue. 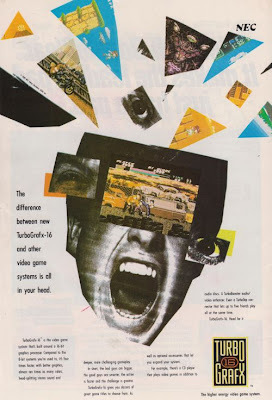 It might be the chunks of stuff like fish bones and banana peels that are all mixed into the muddy gunk, or the ever-present flies and stink lines, but it's all quite disgusting, and it makes the issue's finale especially repulsive. I don't know if that's a recommendation, or just an acknowledgement that Sergio and pals managed to really strike a nerve here, but it's enough to really make the issue stand out. Moral: "Eliminate a problem before it eliminates you!" There's also a parenthetical after the "The End" that reads "(Unless we do something about it)". Spanish words: The region of Basura is aptly named for the word for "trash", and what's more, towns in the area include Quisquiliae (Latin for "rubbish"), Ordures (French for "filth"), and Sordes (a medical term for "deposits of dirt or bacteria on the body"). 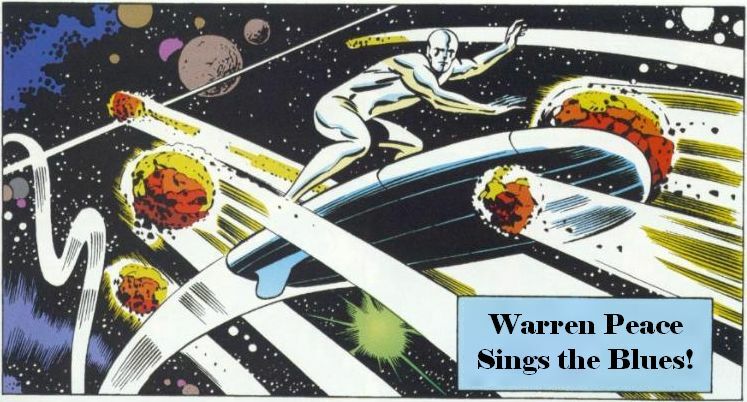 Running jokes: Getting the obvious one out of the way, see Mark Evanier's job for this issue. Drumm says "You never bought me a house!" and "What pirates?" to Pal. The running joke for the issue is that after Sage says that there is money in garbage, Groo spends the rest of the story searching through piles of trash for some cash. 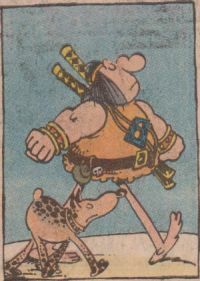 Letter column jokes: Mark D. Warner writes that he has solved the mystery of the blue thing on Groo's chest; it's an ita-koshiate, or a kind of sword-holder made of a board with holes and fastened to a belt. 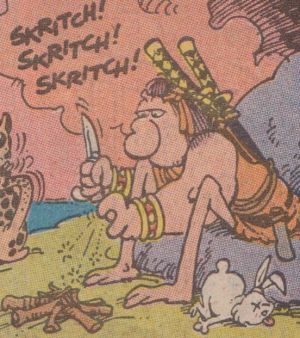 He also says that the little skull on Groo's belt is a netsuke, his dagger is a hamidashi, and he suspects the water in Sage's flask is aqua vitae, or "the water of life". 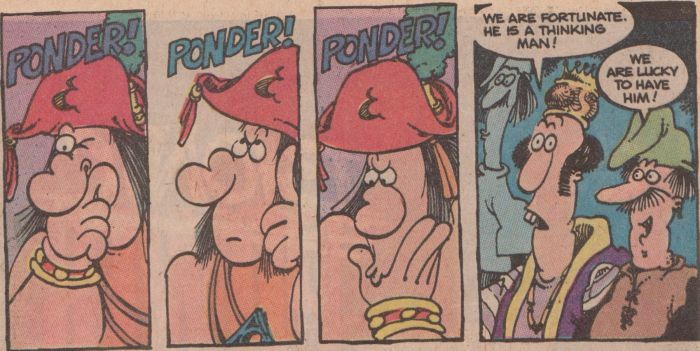 He says that the Groo Crew needs to try a bit harder to be dumb, because "you're starting to make sense to me." Jason Wagner threatens to start buying two copies of Groo each month unless Sergio sends him a picture of Groo. Mark says that from now on, they're not going to send him 12 pictures each month, so he'll have to buy 24 copies of every issue (I think this becomes something of a running joke in the letter column; we'll see). Tunc T. Olcer has a question that's been bothering him: "Just who is that ugly idiot with the orange tunic and the blue thing on his chest?" Mark decides any joke would be too easy, so he skips ahead to the issue's Grooism contest winner, Jason Dalio, who recalls the first words of his grammar school teacher, who said "If you want to succeed in my class, and in life, just remember these three words: think before you act." 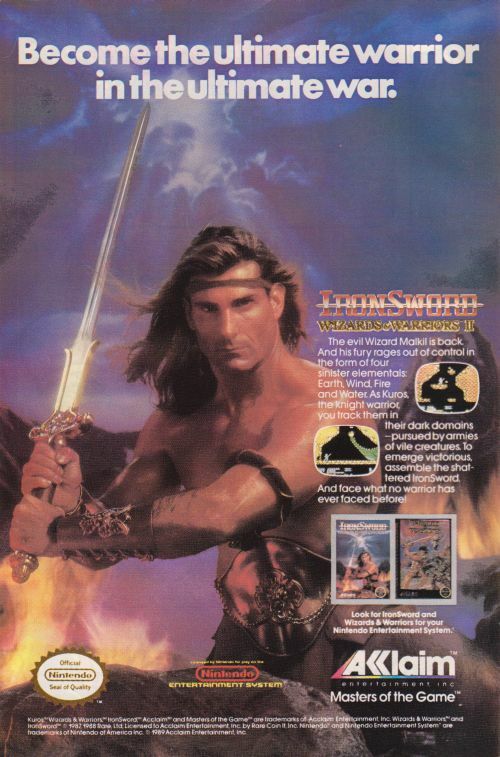 This issue also contains the Statement of Ownership (average copies sold for the previous year: 90,830; copies sold of issue nearest to the filing date: 92,100), but Mark fails to make any jokes about it. What a letdown. The Neverending Fray: My five-year-old could draw that! 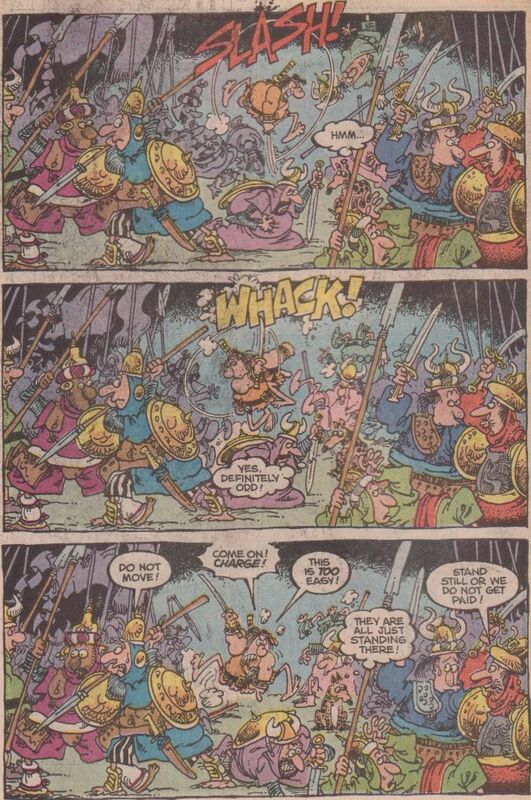 Those first two panels look almost like duplicates, but there are subtle differences, such as the banners moving slightly and characters' expressions changing, to indicate the passage of time between them, and some hilarious larger movements, like the guy Groo is attacking in the first panel falling onto another guy in the second panel. It's a pretty great scene, managing to sell how hard these people are trying to remain still while a violent nincompoop is raging through their midst. This is the sort of thing that I was kind of dreading with this issue, since I hate it when people declare something "not art" because it's different from what they think of as art (Like Serrano! Or Pollock! Or Picasso! Or Van Gogh! And so on throughout history...). But while this story does sort of play into that populist attitude, it's more of an "Emperor's New Clothes"-style attack on people who don't think for themselves, but assume that because a supposedly-knowledgeable person tells them something, then it's true. Which isn't to say that criticism is useless (I wouldn't want to put myself out of a job hobby! ), but it's pointing out that people should form their own likes and dislikes rather than embracing or rejecting something just because somebody told them to. 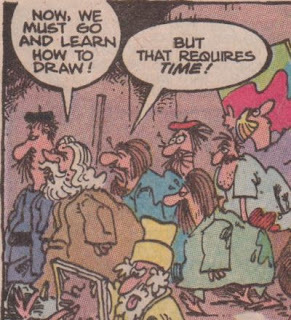 And anyway, this is a goofy comic book making a joke about what it would be like if Groo was an artist, not some grand statement about artistic intent, so everything is handily deflated when the Sage shows up, and Groo asks his opinion on his paintings, insisting that he be honest. Since he's just about the only person who could get away with being truthful and keep his life, his frank assessment of Groo's work as "garbage" quickly sets things right. And so, it's back to the status quo. 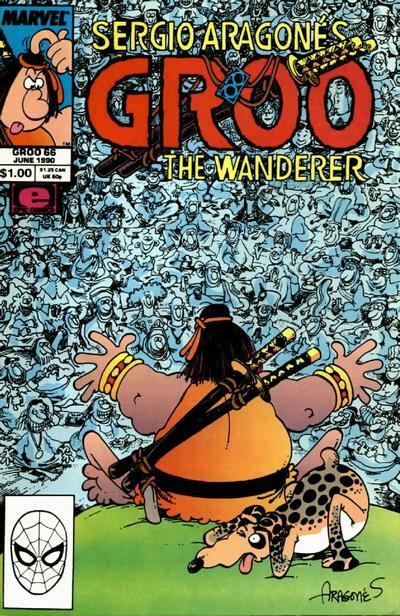 Groo can only remain in people's good graces for so long; eventually, everyone will come back around to the realization that he is an idiot. Hidden message(s): I would have expected to find one somewhere in the various paintings that we see, but I did not. Moral: "Garbage that is well-wrapped is still garbage." Spanish words: King Pecanins might be named after Mexican-American blues singer Betsy Pecanins. Running jokes: In a case of a joke from the letter page making its way into the comic, Groo pesters an artist with questions, one of which is "Can I have a sketch?" David Seigler complains about people coming up with cute ways to try to get their letter printed, since that's not what fan mail is about. 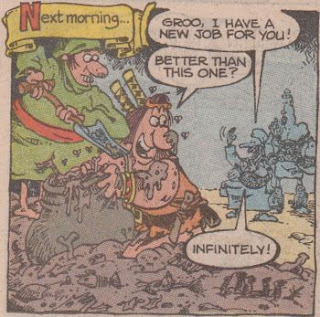 He promises not to try anything like that, hoping to "teach you not to underestimate the high scruples and principled character of a true Groo fan!" Mark says he only printed the letter because of that sentence and wonders why he and Sergio can't come up with funny stuff like that. 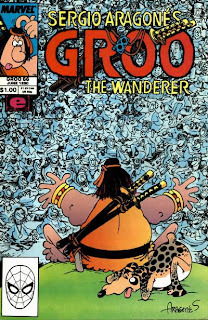 Lon Wolf wonders if Groo is part of the Marvel Universe, the "Multi-verse", or the "Shadow Race", whatever that means. 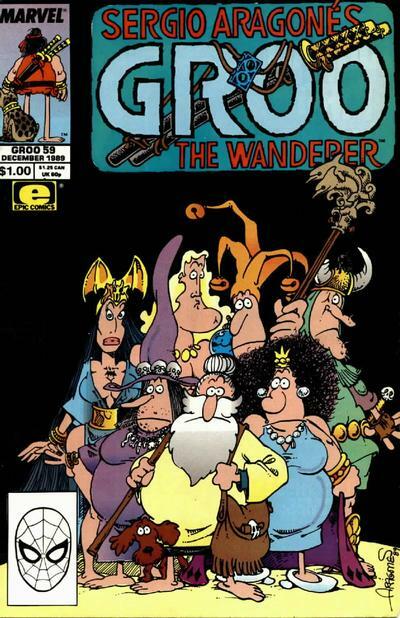 Mark says Groo takes place in the real world, and the rest are just comic books. 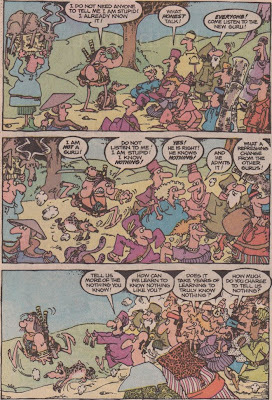 Levi Stahl, representing "The Entire Population of Grooville, Illinois", says that everyone in his town loves Groo, but they've started a feud over whether he is better at eating or slaying, and he asks Mark to settle the issue before violence breaks out. Mark says he wasn't paying attention and asks what the question was again. Finally, Steve Moore contributes the issue's Grooism, which is a story that happened to a friend of a friend about a family that was so excited about paying off their house that they held a mortgage-burning party, got drunk, and burned the house down. I find this tale somewhat dubious. 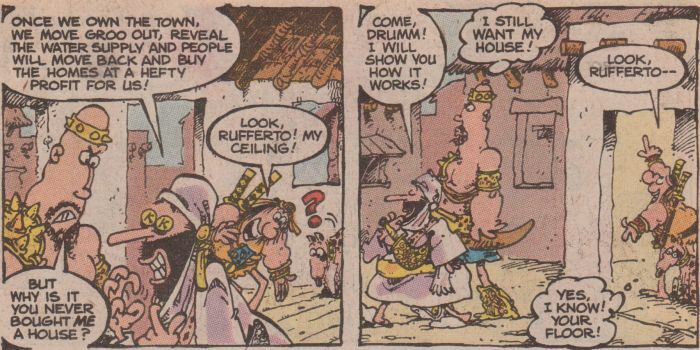 I've always liked Pal and Drumm as supporting characters, probably because they make for an entertaining comedy duo, with Pal (who sort of fits the ugly stereotype of Arabs as unscrupulous, cheating businessmen, although I don't think Arabia actually exists in Groo's world) coming up with elaborate schemes that Groo inevitably screws up, and Drumm acting as more of a physical (and mental) equal to Groo that can be satisfyingly clobbered for calling Groo a mendicant or something. 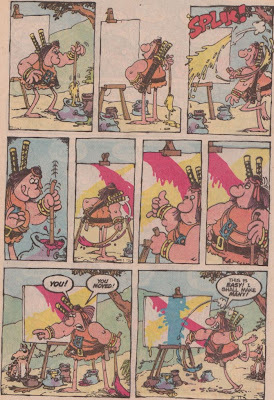 This particular issue focuses more on Pal than Drumm, although the latter does get to act as the dumb foil for the former's trickery, and his increasing offense at what appears to be an act of beneficence toward Groo instead of himself provides a good bit of comedy, and a gag that continues well beyond the confines of this issue. Unfortunately for Pal, other local businessmen get wise to his scheme, and they take it a step further, offering Groo larger houses in other villages so they can profit off his absence in their own vicinity, eventually gifting him with a castle, just as he gets over the novelty of owning a home and realizes that he doesn't want to be tied down to one location. 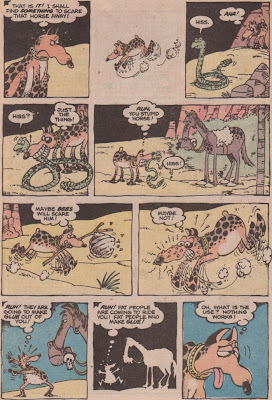 It ends up being an amusing sort of chase, as Pal struggles to keep up with Groo and get him back to the confines of his original plan, but only making things worse as he struggles to contain the force of nature that he unleashed. 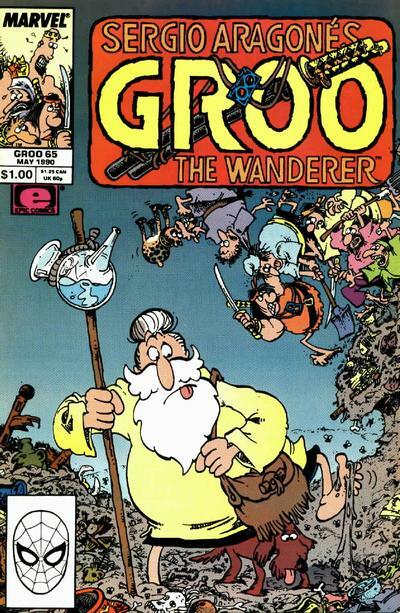 As I always say, basing any plan around Groo is a sure path to failure, and probably death and destruction as well. 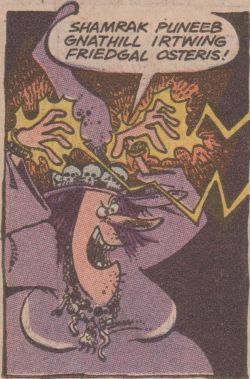 I had remembered this issue as being hilarious, and it's got its moments, but it didn't quite live up to the memory, being more of a low-key form of a chase that doesn't really allow Groo to unleash his full potential for mayhem or destruction. Usually somebody trying to get him to do something leads to much more catastrophic results, but it is satisfying to see Pal and Drumm totally ruined by their own scheme. 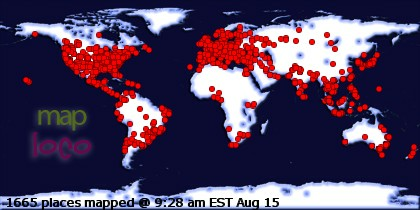 Just look at all those flying figures, collapsing timbers, and fleeing spectators! How he managed to do all that just by pulling the wrong rope is quite impressive. There's just so much going on in that image: guys flying through the air or barely hanging on; all sorts of tools and materials flying about; people staring in bug-eyed disbelief; people falling on top of each other; a couple guys standing on a platform that is slowly collapsing under them; so many screaming faces; people running away clutching small children. 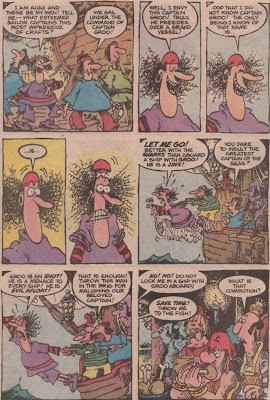 I do like seeing people going about their normal lives before Groo shows up and throws them into disarray, and this issue has plenty of that. It's not as funny as I had remembered, but it's a good time nonetheless. Next: Now that I've caught up on issues which I had skipped, we're finally getting to "The Painter". Recurring characters: Pal and Drumm (whose names, by the way, seem to be a play on the word "palindrome", but there's not really any deeper meaning there, as far as I can tell). And look, Sergio's in the box in the upper left corner of the cover! Hidden message(s): I didn't find one, consarn it. Moral: "You can always buy another house but you cannot put a price on a home." Spanish words: The town of Madrina is named for the word for "godmother", while nearby Rio Largo means "long river". Running jokes: This issue is the origin of the "You never bought me a house!" joke, which Drumm always says to Pal whenever they appear from this point forward. He also asks Pal "What pirates? ", of course. 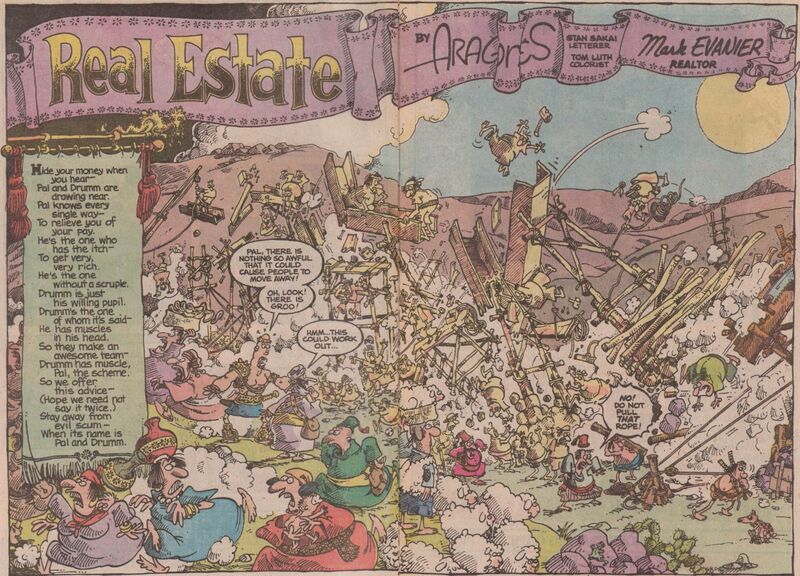 Letter column jokes: Jason Woods writes a nice, complimentary letter about how reading Groo has reawakened his interest in comics, but Mark tells him it's not at all fitting for the Groo letter page, so he provides some examples of more appropriate letters. 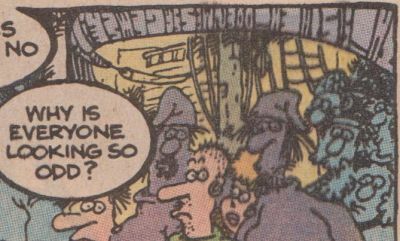 First, there's one from "Hermit" Wilson, which simply says "(letter withheld by request), and then Sean Scanlon writes to Alien Legion and realizes halfway through that he's in the Groo letter column and starts screaming for help. Rol Hirst's letter also probably counts; he(?) says that he likes Groo, "especially the pointy ears, long flowing cape, and yellow and black symbol." Mark replies by saying that Kim Basinger is nowhere near good-looking enough to play Grooella. Shawn Cier provides the issue's Grooism with a story of being on the beach when it started to rain and seeing a man urge his daughter to get into the ocean before they got wet. Mark also mentions receiving a bunch of letters from a Mark Lockwood, each consisting of an envelope containing a foil letter sticker, but not being able to figure out if they spell anything. I don't know if there's ever a resolution to the story, but it's worth mentioning, just in case. 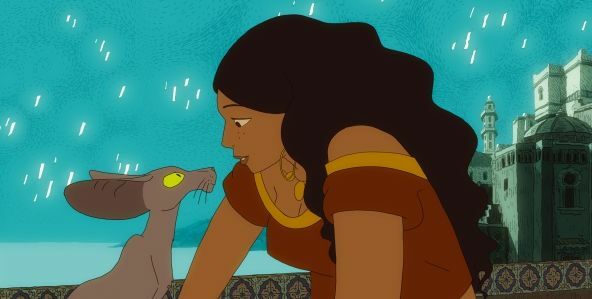 Joann Sfar has such a particular, idiosyncratic style of artwork that one might not expect his comics to translate all that well to animation, but this adaptation of one of his best-known (in the United States, anyway) works proves that notion wrong. If anything, Sfar's artwork makes a lovely transition to movement, with his tactile shading providing a lush, textured look to surfaces while still retaining a hand-drawn look, the characters moving with a nice combination of realism and cartooniness, and beautifully detailed art filling the screen, mostly sticking to a single style but occasionally shifting to distorted or simplified exaggerations for dream sequences and the like. It's absolutely lovely, a joy to watch play out throughout the film's running time, and along with some excellent voice acting and a plot that just kind of meanders along in whatever direction it feels like going, it makes for a wonderful, whimsical bit of entertainment, but one that also provides some thoughts to ponder if one is so inclined. 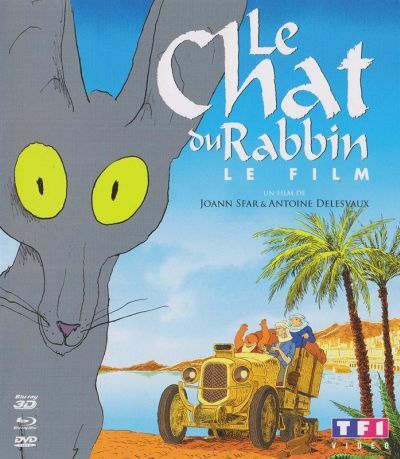 For those unfamiliar with the source material, the story follows a cat and his owners (if a cat can be considered to be owned by anyone), a rabbi and his daughter who live in Algiers in what appears to be the 1920s or 30s. Early on in the story, the cat eats the rabbi's parrot, which gives him the power of speech and kicks off all sorts of interesting shenanigans as the rabbi tries to teach him about Judaism. 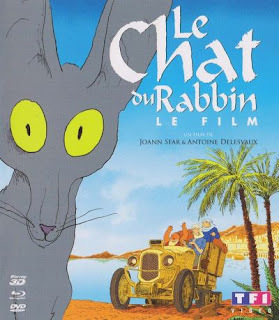 Later, the cat loses his power to talk, and the plot heads off into some weird places, as the rabbi ends up caring for a Russian Jew who fled to Algeria, then goes on an expedition with him to find an Ethiopian Jerusalem that was supposedly the origin of both the black and Jewish races. It's an odd and kind of flighty plot, but what exactly happens isn't really the point; it's more about following around these characters as the cat struggles to understand humanity and religion, even though he would just prefer to spend time with his mistress, the rabbi's daughter. But for viewers, any time spent with these characters is a treat, with the voice acting and animation allowing them to display a real warmth for each other, both a physical closeness and also the kind of affection and irritation that families have. The discussions of religion are fascinating as well, with the cat attempting to learn about Judaism but fighting against a lot of the ideas on logical grounds with a feline contrariness, while allowing viewers to understand the comforting feelings that faith can provide. The rabbi himself has a wonderful attitude, solid in his beliefs but willing to say he doesn't know when the cat prods him with an inconsistency or contradiction. Later on, he meets up with an Arabic cousin who joins the trek to the Ethiopian Jerusalem, and they make a wonderful pair, holding what seem like conflicting beliefs, but willing to accept each other for what they are and share each other's joy and sorrow. It's a rather feel-good look at religion, an inclusive, accepting atmosphere that puts people before dogma (while still acknowledging, through both Jewish and Muslim characters that appear in the story, that there are those in any religion who are much more concerned with the letter of the law than with its spirit). It might be a rose-colored view of a past that never was, but by making some of the most contentious religions on the planet seem warm and friendly, it provides a window into what can make beliefs so important to people, without condemning those who don't toe that particular line. 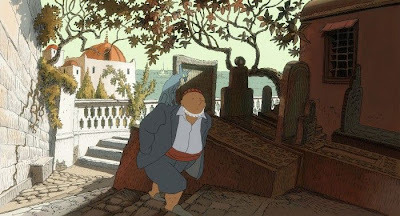 Religion aside, the film is a gorgeous trip into a world that springs to life from Sfar's imagination, and it's full of great visuals, goofy asides (including a meeting with Tintin that reveals him as kind of a racist, or at least a condescending jerk), cute character moments, love and warmth between people (and animals), expressive flourishes, nice voice acting (I like the way the cat's meows don't try to replicate an actual feline sound, but just consist of actor François Morel saying "Meow"), and a wonderfully realized setting. It turns out that there was no need to doubt the suitability of Joann Sfar's sensibility for animation; it ends up being a perfect realization of the look and feel of his comics. And hopefully it won't be the last time we get to see it either. Judging by this issue's stated moral, its message is supposed to be about jealousy, although I find it more amusing as a look at the overdramatic affection that dogs can have for their owners. When Groo acquires a horse, Rufferto immediately becomes jealous, sure that Groo is going to leave him behind in favor of a new traveling companion. While Groo has no intention of forsaking his loyal dog in favor of a different animal (we learn from his thoughts that he plans to eventually eat the horse), circumstances, along with Groo's general obliviousness, conspire to reinforce Rufferto's worries. But don't worry, by the end of the issue, Rufferto realizes that Groo still loves him, and always will. It's a bit overly sentimental, and Rufferto (when judged by human standards) comes off as kind of an insecure jerk, but it's nice to get a reaffirmation that our pals will always stick together. However, I find it interesting to judge Rufferto as a dog, and see how the issue reflects that sort of intense affection that dogs often have for their owners, a need to demonstrate love and affection and have it returned, along with a jealousy toward interlopers. Given access to their inner thoughts (and an increase in intelligence necessary to make those thoughts worth accessing), most dogs would probably act much like Rufferto does here, showing complete and total love toward their master, but also brimming with anxiety that something will separate them. It must be pretty exhausting, especially with a master as impulsive and unpredictable as Groo. Really, he just needs some regular affection; is that so hard, Mr. Mendicant? That's not bad, but it's far from the heights of this series' comedy. I'll take what I can get though, and luckily, next up is a classic, at least from what I remember. Let's hope it holds up. 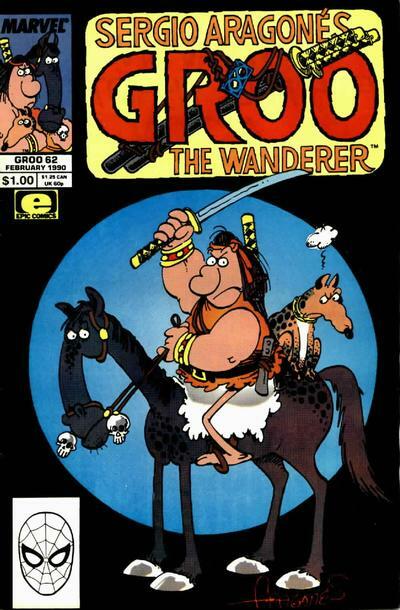 Recurring characters: None, unless Groo's horse turns up again. Moral: "If you doubt a friend, you are not being a friend." 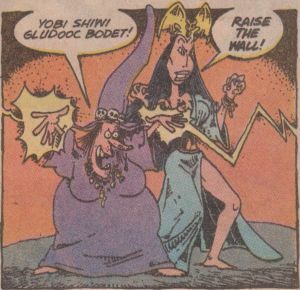 Letter column jokes: Eleven-year-old reader Joel Turkel complains about how Groo's behavior changes around Chakaal. Mark says that men do strange things when they're in love, and some have even been known to bathe. Somebody calling himself "The Phantom" claims he has some incriminating photos of Mark and blackmails him for $3.65 each week. Mark agrees, even though he says it's his whole salary, as long as The Phantom sends him an assortment of sizes, and they had better feature his good side. Eric Purtle contribute's the issue's Grooism, quoting rookie Chicago Cubs catcher Rick Wrona, who said, "You only hit your first home run so often." Mark says he'll send him a certificate as soon as he can scrape up enough money to buy a stamp. Some Canadian readers named Jorey and Corey say they weighed their Groo collection, and the result was 937.8 Groo-Grams, or .9378 kilograms. 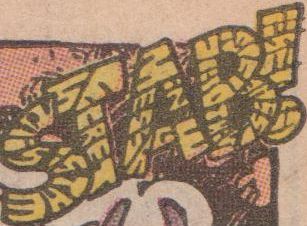 Mark tries to convert this to pounds, but gets confused as to whether this letter page should be included; that is, do they include Groo-Grams in their measure of Groo-Grams? 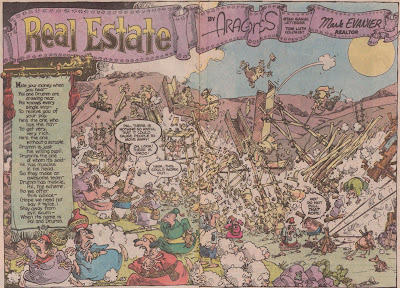 This issue sort of revisits the theme of issue #37, in which Groo's impending arrival to a town caused it to go to hell overnight, with property values plummeting, ne'er-do-wells arriving to take advantage of the situation, and everyone at each other's throats. This time around, it's the large supporting cast that jumps in to screw everything up in Groo's absence, since he had recently disappeared to a distant land where his reputation is not as dire (although we do see him and Rufferto on the last page, approaching a town which had been all but destroyed in his name, presumably about to add insult to injury). 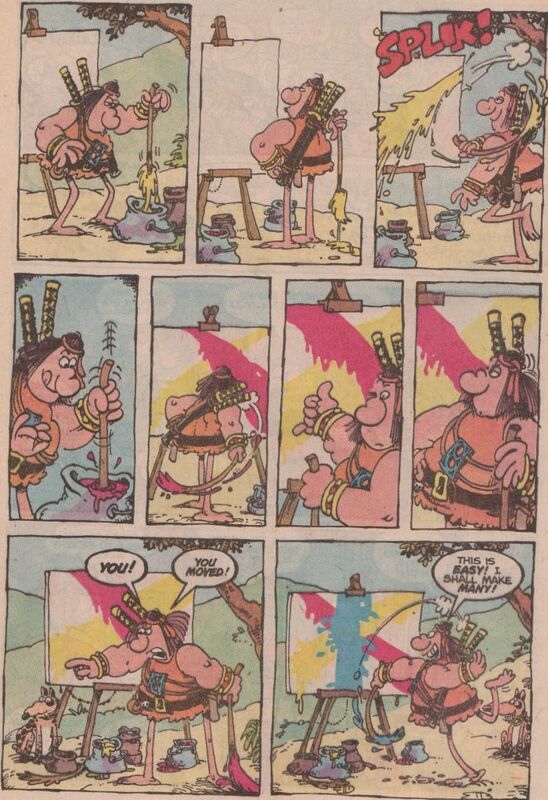 Is this a demonstration of how Groo can manage to ruin things even from so far away? Or is it an indication that he's not the real problem, but rather a flawed culture which upends itself in response to an overblown threat? I would tend to choose the latter, especially given the large number of terrible decisions made by every familiar face here, even (especially!) 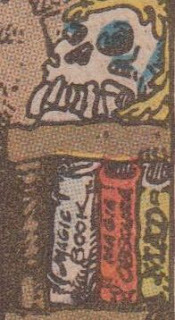 the Sage, who kicks everything off by advising the king of a land which is happy and prosperous due to Groo's absence to build a wall which will keep the Wanderer out in case he ever does decide to show up. Sage himself notes that he was just trying to create a need for his services, and this greedy decision sparks a cascade of consequences when people from all around decide to move to this town that will be safe from Groo, causing all sorts of overpopulation problems and wreaking havoc on market prices, but also enraging Grooella, since all her taxpayers are moving away. Taranto and his gang of bandits also receive word of the Grooless city, which prompts them to come and raid it, so the king sends for Arcadio (accompanied by the Minstrel, as usual) to provide defense. 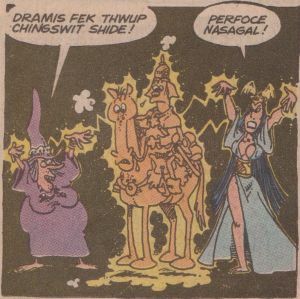 And finally, Arba and Dakarba decide to come practice their magic in a place where Groo won't be around to screw things up. When they all converge on the poor little town, the expected chaos reigns, hopefully teaching all of our pals a lesson about who is the real cause of their troubles. They almost certainly won't learn anything though, and they'll still blame Groo for everything. I guess this demonstrates how much of a creative spark Groo brings to these stories; they're just not the same without him. But that's fine, there are well over 100 other issue that place him front and center. I know where to go whenever I want to find him, that's for sure. Next: More horsing around in issue #62, "Horse Sense"
Moral: "All life affects us...even that which is far from our gaze." Spanish words: The town of Susto is named for the word for "scare". 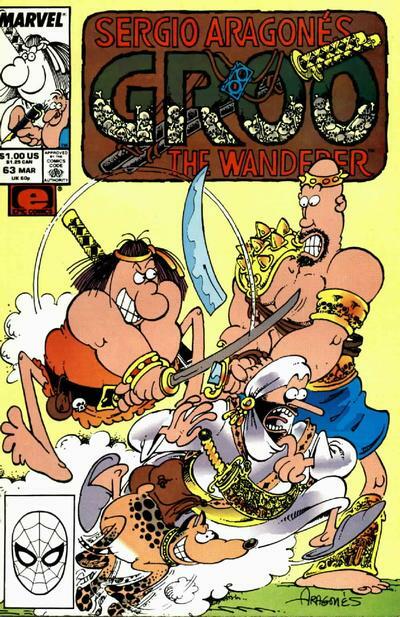 Running jokes: Without Groo to bear their brunt, the regular jokes aren't included here, but there are a few that continue throughout the issue, such as people insisting on including "pillaging" whenever anybody mentions looting and sacking, or everyone noting that Arcadio has a huge chin. 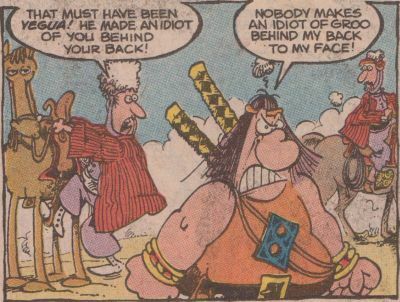 Letter column jokes: Mark agrees with Andries Harms that the blue "thingamabobber" on Groo's chest is a buckle of some sort. Andries also asks why Groo never wears armor (Mark says it's because his head is magnetized and would stick to the armor, causing him to walk like Groucho Marx), why Groo's upper and lower body are out of proportion and why he has such small elbow joints (this is the way Sergio thinks people are supposed to look, which is why his previous career as a plastic surgeon was a disaster), why Groo wears a belt when he doesn't wear pants, and why he has a little skull on his belt (he wears the belt to have someplace to hang the skull, and he wears the skull to decorate his belt). 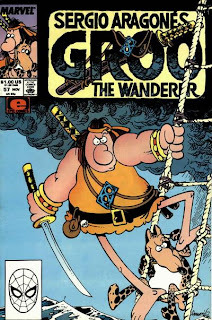 Diane "Doc" Westerfield wonders, since Groo doesn't wear pants, where he keeps his wallet and whether he wears underwear. Mark says he has no wallet since he has no money and got turned down by American Express, and he refuses to discuss his underwear or lack thereof, since this isn't a horror comic. Finally, B.J. Lyda contributes this month's Grooism, in which he was giving a class report on Neptune and accidentally said it was the "aped" planet from the sun. He still got an A, so Mark says both he and his teacher deserve a Grooism certificate. Where did such a thing come from? What is life like on board? How long have they been floating around the ocean? What sort of interactions do they have with other ships? We only get the barest hint of life for its denizens, who we first meet mourning their captain, who, as commander of the ship, outranked even the king. But later we learn that they've been floating in circles without ever seeing land, so he can't have been a very good captain. There's the suggestion of an interesting story there, and while it's not necessary to learn the history or biography of every land and person Groo encounters in his wanderings, the vagueness of this particular example suggests that Sergio had a neat visual idea for a setting, but he and Mark only constructed the barest bit of story around it. 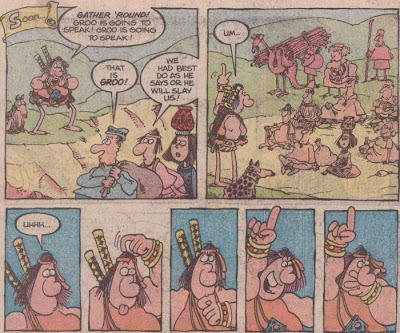 It seems like a real missed opportunity to provide a glimpse of the lives that Groo has interrupted this time around. How dare Sergio not squeeze every possible ounce of entertainment and edification onto these pages for my enjoyment! Really, it's a rather enjoyable issue, tying itself up in a neat little conclusion that manages to fulfill Ahax's prophecies of doom while defying Groo's (and the readers') expectations and resulting in him being hailed as a hero, even if he never finds out about it. That's not a bad trick, and with all the comedy contained in the issue, there's really no need to complain. 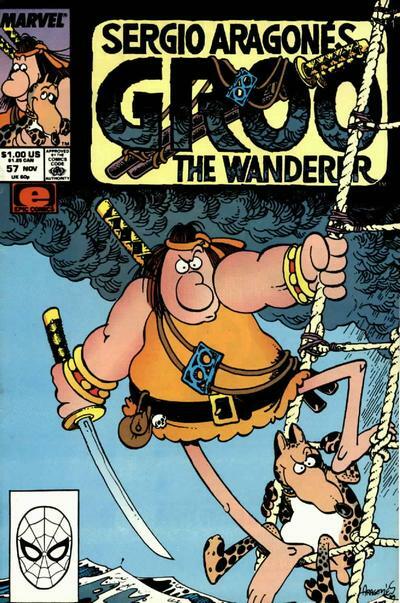 I still do though, since I see potential for more, and I know the Groo Crew is capable of delivering it. Yes, I demand absolute perfection from my silly barbarian comedy! But really, I'll take what hilarity I can get, and I know I won't be disappointed. Next: I found my copy of issue #59, "One Fine Day"
Moral: "Out of the worst can often come the best." 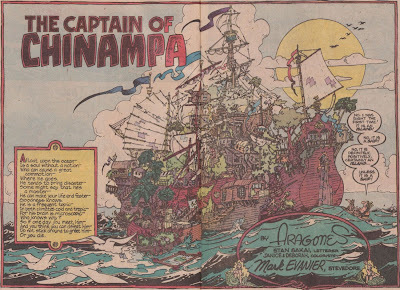 Spanish words: The huge, crazy ship is named Chinampa, which isn't apparently Spanish, but is a word for a kind of farming people did in ancient Mexico. Running jokes: Groo thinks about eating Rufferto again, but immediately regrets it, since he has no firewood. 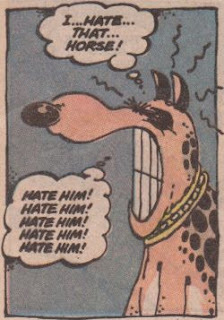 Groo also eats disgustingly, but nobody seems to mind, at least at first. 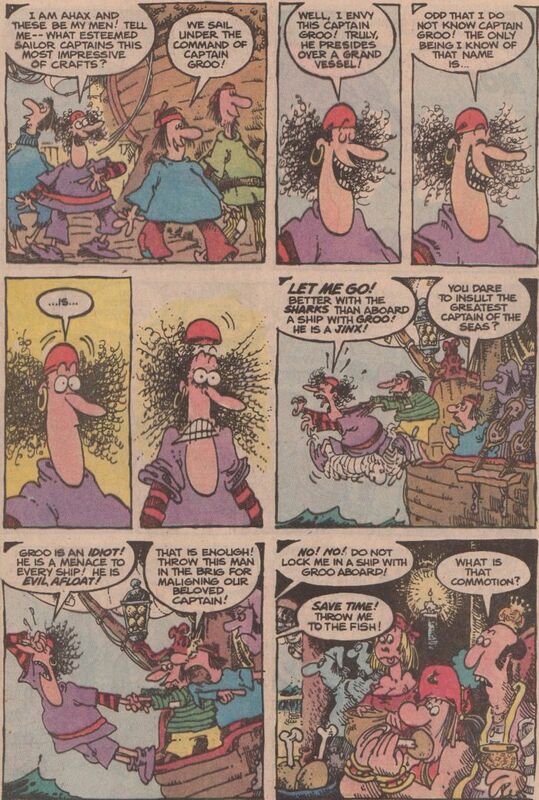 And yes, Groo's propensity for sinking ships is much discussed. Letter column jokes: Bob Moore asks exactly what kind of water the Sage has in his flask, "perrier, seltzer, mineral, pond, Mississippi River, lake, ocean, polluted, or just plain old tap water"? Mark replies that it is plain stream water. He used to carry a potion called Instant Water, but he could never figure out what to add to it. 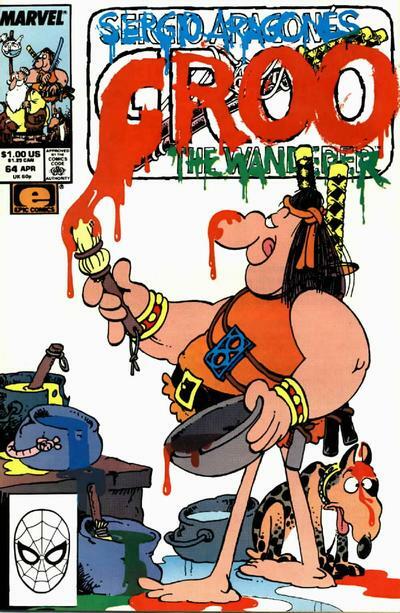 Stewart Lewis says the makers of Groo are "turning the minds and souls of today's young people into helpless, slobbering dog sausages," so they should be "dragged out into the street and [a] shot, [b] dismembered, [c] stoned to death, [d] force fed sausages, [e] forced to read Groo, Mad, and Oprah Winfrey transcripts, and [f] forced to watch Bob Hope vacation slides," but he adds a P.S. saying to keep up the good work. Shannon Davis asks a list of numbered questions, including a question about half of Sergio's moustache being shaved off that Mark corrects by saying that was a joke and he would never do something like that to Sergio, but he did tattoo a life-size picture of Roseanne Barr on his body, and when he ran out of room, he had to continue onto Stan Sakai. And David Wilmes contributes this month's Grooism, in which a kid in his sister's anatomy class asked if it was possible to live without any bones. Sounds pretty Grooish to me. 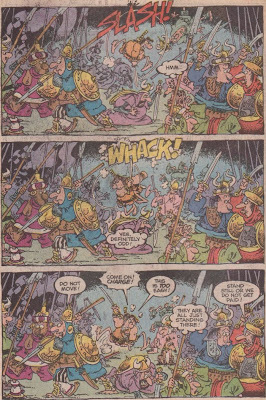 The thing about Groo is that he's destined to screw up pretty much everything he tries to do (except slaughtering large groups of soldiers, thieves, or anybody foolish enough to get in a fight anywhere in his vicinity). This provides readers with copious comedy, but since anyone and everyone can bear the brunt of his ineptitude, some poor, undeserving fools are going to get screwed along with those who so justly end up with their lives destroyed. 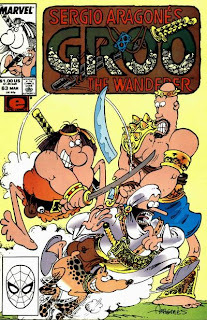 It's a necessary effect of Groo's unpredictability, since one can never expect him to do anything as planned (and let me note how impressive it is that the creative team manages to keep him so unpredictable and keep coming up with funny ways for him to defy expectations throughout the entire life of the character), but it can lead to some unhappy, and therefore potentially unsatisfying endings. One can always cheer when the crafty bandits or evil kings receive a comeuppance, but the poor merchant who trusts Groo to guard his wares only to see everything he owns stolen or ruined? That's somewhat less palatable. Of course, everything can be forgiven if it leads to comedy, and tempering the destruction visited upon the fairly innocent while ensuring maximum impact on the evil can mitigate any distaste. Take this issue, for instance. Groo gets involved with some horse traders, doing his best to keep their animals from being stolen by a band of thieves, or to recover them when they inevitably are. 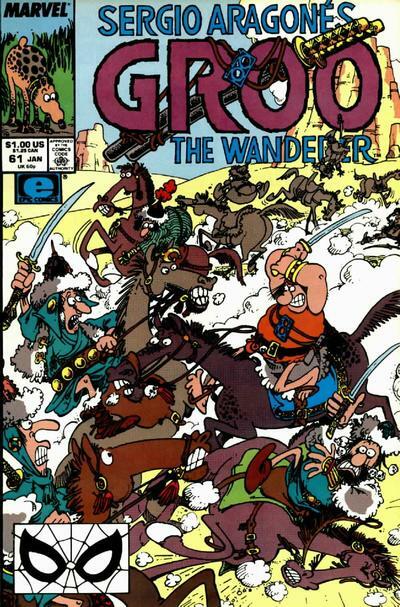 It's a funny back-and-forth of a plot, as Groo defeats the bandits, only to have them trick him and steal some or all of the horses, which he then manages to recover, only to be tricked again, and so on, all leading up to a confrontation that decides the horses' fate for good. 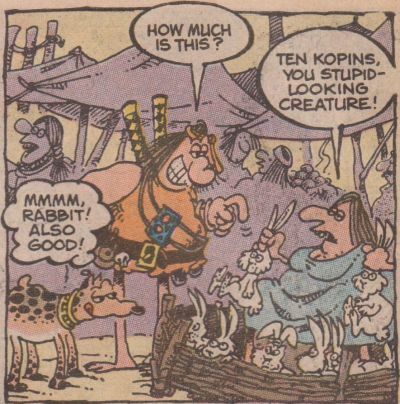 It makes for a lively, funny read, as one wonders how the bandits will fool Groo each time, and how he will counter, with the continued expectation the he will manage to screw things up for both sides before the story is over. Do the horse traders deserve what eventually happens? 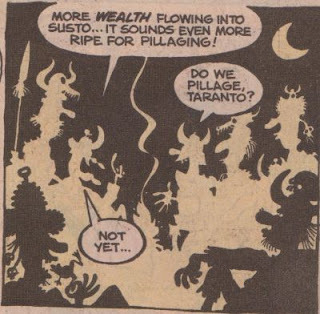 Not really, but that's what they get for trying to base their plans around Groo, even if said plans are meant to be positive. I can never get enough of that sort of thing. And that's just one type of joke in a series that contains much, much more. You want slapstick violence? Insults to people's dignity? Just plain funny drawings? This series has it all! Next: I think the next issue I have is #64, "The Painter". Moral: "When you do not think for yourself, no on thinks for you..."
Spanish words: King Caballo is named after the word "horse", of course. On the other hand (or hoof), the bandit Yegua is named after the word for "mare". Even thought it's not Spanish, Porto Pass might be named after a city in Portugal. 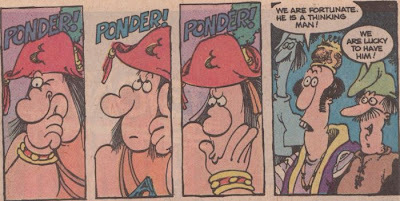 When Groo gets called a "pedestrian", he wonders if it is anything like a "mendicant". 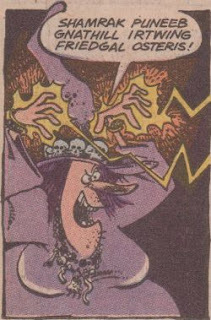 Groo vows to teach the bandits to "play me for the fool I am!" Letter column jokes: Damian Ritter offers a numbered list of questions, asking what is the true reason for life, what is Groo's reason for life, what is Mark's reason for life, and why people write letters that have nothing to do with the comic. 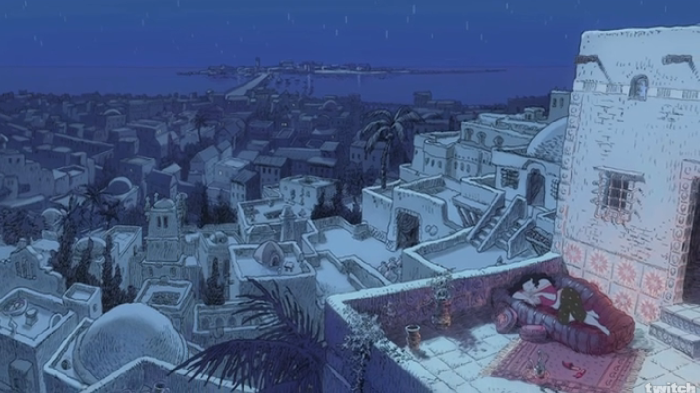 Mark answers the first by saying that the true reason for life is to bring joy to others, then says that is not true of Groo, himself, or off-topic letter-writers. Gary Chaos Parnassus tries to hypnotize Mark into piercing Sergio's right ear and soaking his feet in a bowl of warm cheese dip, but Mark says the joke is on him, since Sergio's right ear is already pierced and his feet are already soaking in cheese dip. Timothy King offers this month's Grooism, relating a conversation between two friends in which one said that the other was saying that everything is relative, and the other said no, it just depends on how you perceive it.